There were about 250 vendors at the Quilt Festival. 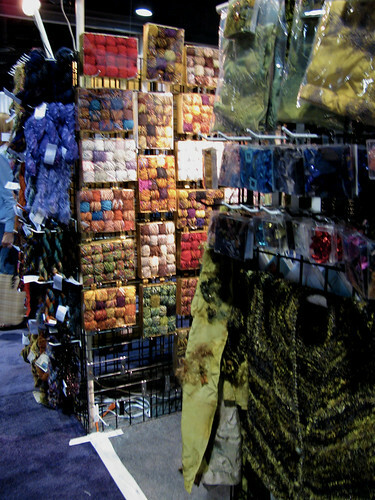 I saw so many lovely fabrics, patterns, notions, yarns, ribbons, beads and $10,000 sewing machines. Those I will write about tomorrow. I set a hundred dollar limit on myself and it was easy to stick to since I was trying to figure out a way to afford one of those sewing machines. I stayed within budget even with our exorbitant LA County sales tax. A few clover sewing notions, one bag pattern, and batik fabric strips to make it with were enough to satisfy my shopping appetite. For the knitters there were yarns. 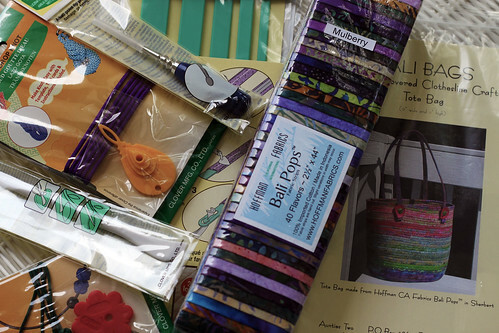 Novelty yarns are also used in quilting for decorative embellishment. So one could buy whole skeins or even just a few yards of some of the more expensive yarns. I really thought hard about buying a box of the novelty yarns badly photographed below. I thought it would be fun to knit something with lots of little bits of coordinated yarns. Each box was over a hundred dollars so I passed on it. I felt a little funny photographing in the vendors booths. Maybe by next year I wont be so self conscious. The prettier sweaters are around the corner where I thought I would be too obvious. 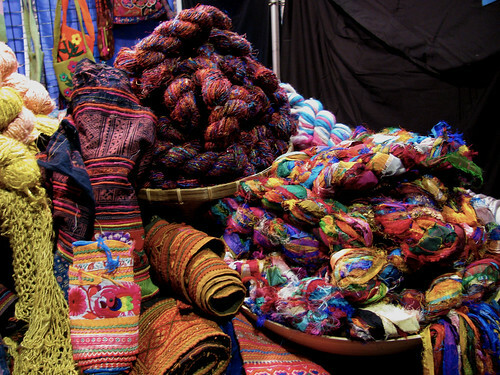 I have seen the recycled silk fabric yarns in catalogs. I didn’t realize how soft the yarn would be. Just like a worn cotton shirt is softer than a new one, worn silk has the same comfy softness. Those skeins were tempting too. This entry was posted on Monday, July 27th, 2009 at 3:00 am and is filed under Sewing and Yarn. Tagged: Sewing, Yarn. You can feed this entry. You can leave a response, or trackback from your own site. My LQS offers a class on the bag pattern you purchased. It’s really cute! How fun! I’m sure you had a ball shopping! That box of novelty yarn would make a lovely wrap!